And now, the post that’s taken far too long for me to write. 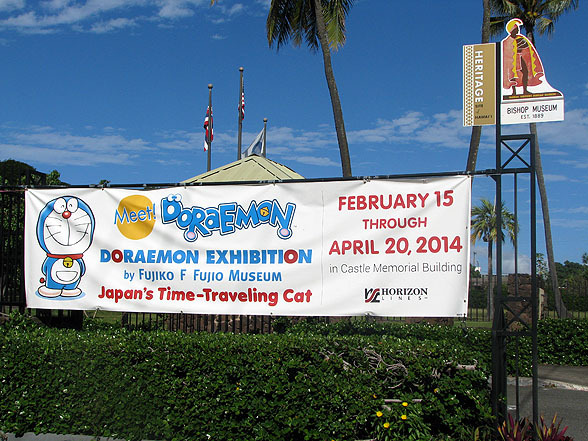 … but you may also see Doraemon and friends on the side of a LeaLea Trolley on streets near Ala Moana and Waikiki. 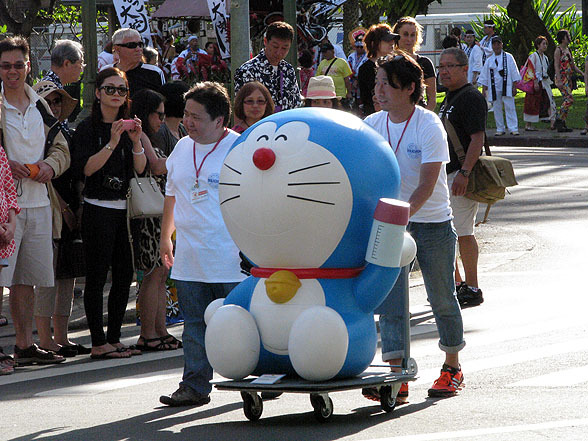 Or, if you were watching the Honolulu Festival’s Grand Parade last month, you could see him being wheeled along the parade route. It’s been a fun past few months, but you only have nine days left to see it — the Doraemon statues, Fujiko F. Fujio artwork, Anywhere Door and a whole bunch of other stuff will be packed up and head back to Japan after April 20. I could go into excruciating detail as to why it’s taken so long for this post to be written — the cold! the writer’s block! Kawaii Kon prep! But the main point is that time is running short, there’s another museum free-admission day right around the corner — YMCA Healthy Kids Day on Saturday; kamaaina and military with valid ID, step right up — and I wanted to get something posted on the record before then. 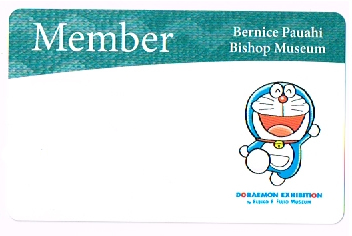 I’d also be remiss if I didn’t mention that if you sign up to be a museum member now, you’ll get a special Doraemon-edition membership card. Annual memberships start at $50 general, $45 seniors and $35 students and net you admission to the museum, along with a number of other perks that pile up at higher tiers. But c’mon, is this not the coolest museum membership card you’ve ever seen? 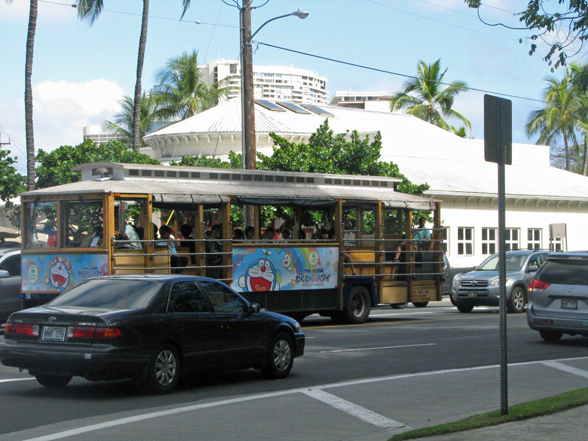 It should be noted that it’s possible to see Doraemon at a number of points between Kalihi and Kahala right now. I’ll go into that in more detail in my next post (along with details about a contest this month that’s quietly unfolded on Instagram), but today’s post focuses more on what’s on display at the museum. Whether you’ve already visited, have yet to do so or can’t make it out here before it closes, I hope you’ll enjoy this virtual tour of 67 percent of the exhibit. As for that other 33 percent: You’re going to have to figure out some way to see that for yourself. The gallery portion of the exhibit, featuring manga pages drawn by Fujio, is off-limits for photography and video recording. This much can be said about it, though: In that section, there’s a timeline of Fujio’s career, a giant photo of his desk, and five themed galleries, each one based on a Doraemon movie: Nobita’s Dinosaur (1980), Nobita’s Great Adventure Into the Underworld (1983), Record of Nobita’s Spaceblazer (1980), Nobita and the Steel Troops (1985) and Nobita and the Haunts of Evil (1981). It’s a pretty even split between Fujio originals and reproductions on display — 36 of the exhibit’s 70 pages are originals, 34 are copies — but it takes a really close look at each piece to tell which is which. Next time in Otaku Ohana: Noticed all those statues sitting around the exhibit? There are 10 at the museum … and another 13 (that I know of so far, anyway) out in the wild. I’ll have a guide to where you can find all of them … if you’re as obsessed as I am about such things, anyway.